Does your small town church desire to do outreach and evangelism in your community, but you don’t have the budget to always rent things like bouncy houses, sno-cone and pop-corn machines, or other carnival-type games? 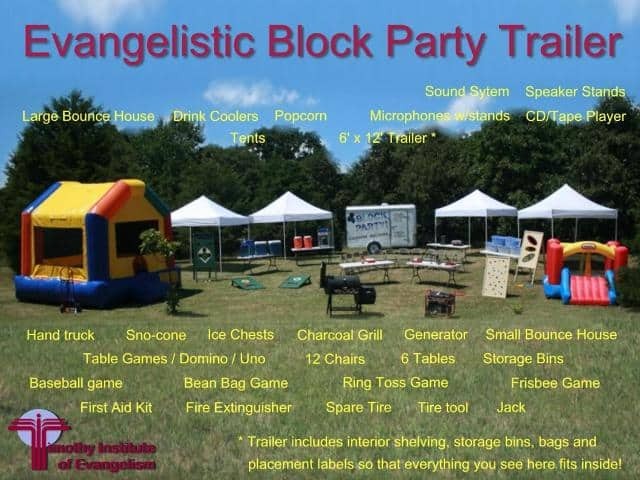 Then going in with some other area churches on a block party trailer may be just the shot in the arm your evangelism ministry needs. Last night our local association, the Mid-Tidewater Baptist Association, voted to use some funding available to us to buy and build a block party trailer. Our Director of Missions (DOM) retired earlier in the year, and our new DOM doesn’t begin until January 2016. This means we have roughly $14,000 left in budgeted salary for the year that will go unused. I brought the proposal to the Executive Committee that we use those funds to better equip our churches for outreach and evangelism. So what is a block party trailer? The idea is that churches can reserve the trailer throughout the year for a nominal fee (which helps with maintenance and upkeep). The estimated rental value of the contents of this trailer is $1200, but most organizations with such trailers only ask $200 to reserve the trailer. For small town churches, this can be an INCREDIBLY GOOD DEAL, enabling rural congregations to do outreach in a way that was previously (for many) a financial impossibility. How can your church partner with other churches to do outreach and evangelism more effectively? 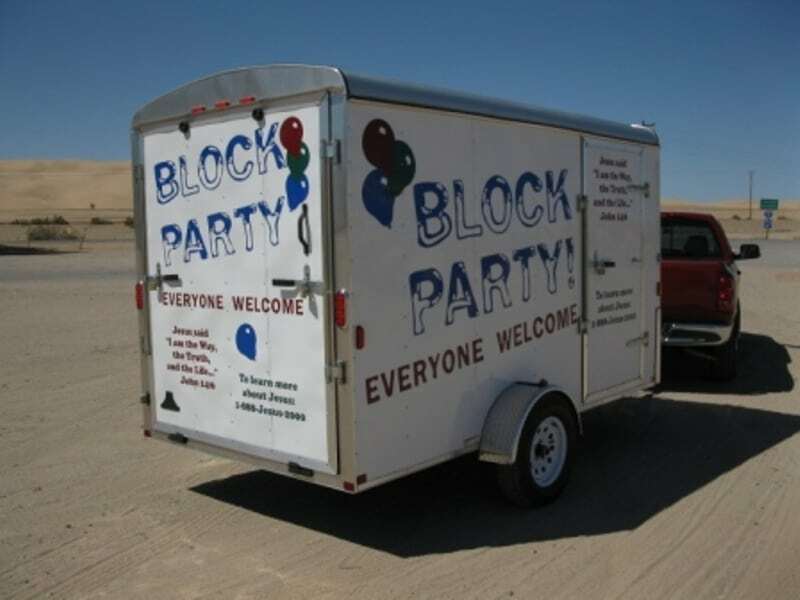 I, for one, think a block party trailer is a great idea, and look forward to working with folks in our association to get this idea off the ground. As we continue working on this project, watch for more updates! Where do you buy one?? Just saw your comment from a while back! We got a trailer donated from a local manufacturer, and raised about $6000 to buy the contents of the trailer. Great idea Jonathan, and don’t let anyone tell you that these things are great tools for the Church. While they may not yield in the area of evangelism in a direct way, things like this do show the community that you care, and that having fun is not a crime. in the long run, in a more indirect way, these things help create a positive perception in the community and go a long way towards helping your church reach people who need Jesus. Quick question, do you know of any organizations that build “block party trailers” for sale? I’m not very familiar with them, but as you will see, I got some information from them for the above article. Send the money to a struggling ministry somewhere. Please consider a missionary or a church in financial trouble. Help a bivocational pastor in debt. Snocones and bouncy rooms are not needed. Great evangelism training will bring more to Christ than a carnival. All of the causes you mentioned are worthy causes, and our churches already support ministries that fulfill those missions. The mission of the Mid-Tidewater Association is “to provide the means through which member churches cooperate and join together in spreading God’s Word and serving those in need.” We felt like this endeavor helps us fulfill our unique mission of helping local churches partner together in local mission and ministry. Evangelism training is part of the strategy for this, and was discussed last night at our meeting. We have to engage people if we want to share the Gospel with them, so I see it as a both/and. Evangelism training will definitely be done in conjunction with the rollout of this resource. Many other Christian groups and associations of churches have found that creating a welcoming environment through hospitality and building relationships with neighbors is conducive to effective evangelism. The idea had overwhelming support yesterday, and many gave testimony to how similar ministry tools in neighboring counties have helped in leading people to Christ. The decision to invest in this ministry resource was unanimous, and one pastor even said to me afterwards, “I’ve been a part of this association for over 20 years and never been as excited as I am after tonight’s meeting.” This is certainly not the only way to do evangelism, but it has been proven effective in multiple areas, and seems to strike a chord with many people. Money best be spent in portable pa systems, tracts and evangelism training. Sorry this is just another carnival. John, I invite you again to read (above) the ministry guidelines we are basing this idea off of, which explicitly state the need to do evangelism in conjunction with the trailer’s usage. One of the items to buy for the trailer is a PA system, and churches will be encouraged to provide New Testaments and tracks of their choosing when using the trailer. Also, evangelism training goes in conjunction with launching this ministry. Its definitely important to keep focus on Christ in all that we do.